Dr. Gurza is pleased to offer many options for your orthodontic treatment. We offer traditional metal braces as well as appliances that are more aesthically pleasing and that provide shorter treatment times for many patients. Traditional metal braces are the most common type of braces and are more comfortable today than ever before. 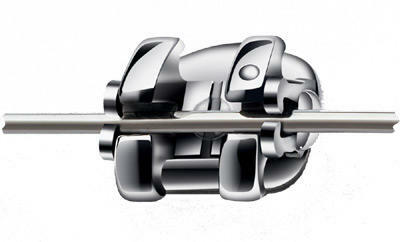 Made of high-grade stainless steel, metal braces straighten your teeth using metal brackets and archwires. With metal braces, you have the option of adding coloured elastics (rubber bands) for a more unique and colourful smile. SmartClip™ Self-Litigating Braces are the modern choice in orthodontics. They're computer designed and use a special nickel-titanium metal alloy to make your treatment more comfortable, save time and give you the result you want - a beautiful new smile. Ordinary braces use "elastic bands" (technical name "ligatures") to secure an archwire into a slot in each bracket. This is called ligation. The bands can become stained or stretched -- requiring your orthodontist to change them. They can aslo retain food particles, making it more difficult for you to keep your braces clean. And, your orthontist will have to take these bands on and off to change or adjust the archwire during treatment. No fun. SmartClip braces are different. They don't use ligatures to hold the archwire...they're self-ligating. Instead of elastic bands, SmartClip braces use small metal clips to hold the archwire into the bracket. So you can forget about the problems associated with elastic bands. Invisalign uses a series of invisible, removable, and comfortable aligners to straighten you teeth. And, no one can tell you are wearing the aligner because it's invisible! Not only are the aligners invisible, they are removable, so you can eat and drink what you want while in treatment, plus brushing and flossing are less of a hassle. The aligners are comfortable and have no metal to cause mouth abrasions during treatment. Click here for a more detailed description of invisible braces. Ceramic braces are made of clear materials and are therefore less visible on your teeth than metal braces. For this reason, ceramic braces are used mainly on older teenagers and adult patients who have cosmetic concerns. While they are visually less prominent, they do require more attention to oral hygiene as ceramic braces are larger and are more brittle than their metal counterparts. For these reasons, ceramic braces tend to be used more on upper-front teeth than on lower teeth.